Air craft: The Short Solent was the civil adaption of a more powerful Sunderland aircraft. This painting was based on the ZK-AML which was christened ‘Aotearoa ll’ by H.R.H. Princess Elizabeth in 1949. In addition to being operated on the trans Tasman Sea routes, the Solents were also used on the glamorous “Coral Route” from Auckland to Fiji, Samoa, the Cook Islands and Tahiti. Godwit: The two white bird motif’s represent the godwit or in the Maori language ‘kuaka’. 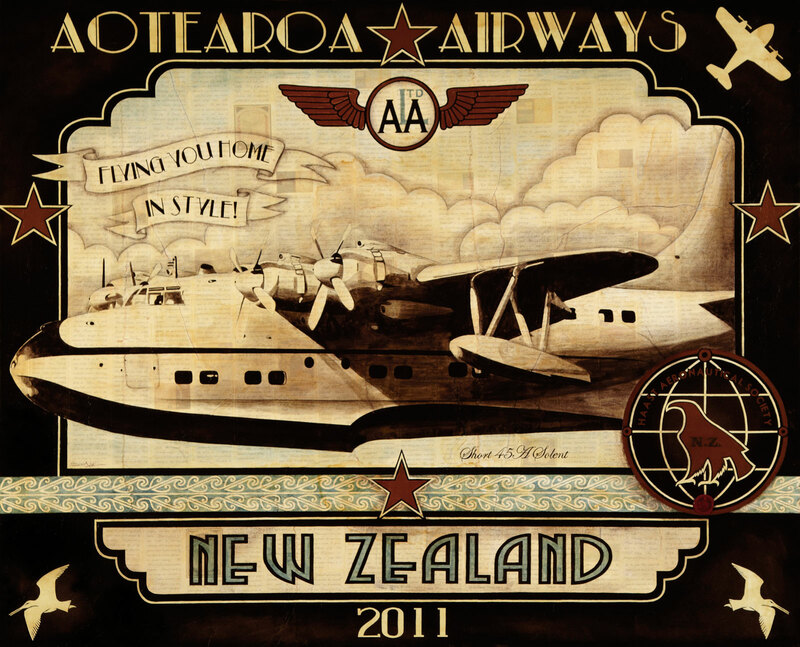 Aotearoa Airlines Ltd logo/wings: Inspired by the five ‘wings’ insignia of the NZ provincial airline main trunk operators. Haast Aeronautical Society: A logo I created introducing the Haast eagle to refer to the first largest flying ‘thing’ in the skies over New Zealand.